U.N. Secretary-General António Guterres appealed Tuesday for the parties in Syria to avoid a full-scale battle for Idlib. 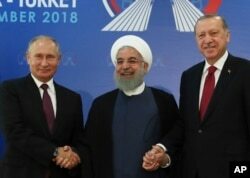 Russia, Iran and Turkey are known as the Astana guarantors — they oversaw the creation one year ago of four de-escalation zones in Syria that were supposed to be safer for civilians. They included parts of Idlib, Hama, eastern Ghouta and southern Syria. Only Idlib remains, the others have been militarily brought back under regime control. Earlier, the U.N. Security Council met at Russia’s request so it could be briefed on the outcome of last Friday’s summit of the presidents of the Astana group. It was the third meeting on Idlib in the past week. Turkey’s U.N. ambassador renewed his president’s calls to preserve the Idlib de-escalation zone and called for an immediate cease-fire. He urged the international community to support Turkey’s call for a cease-fire. U.N. 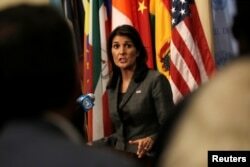 Ambassador Nikki Haley said the United States would consider any large-scale military assault on Idlib as a “reckless escalation” and called on Russia to prevent it. The Russian ambassador noted that de-escalation zones were created as “temporary entities,” not permanent ones. 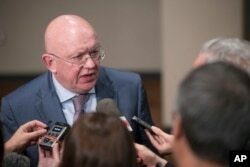 Nebenzia dismissed plans by the Syrian regime to use chemical weapons, saying they no longer had any, and if they did use them, it would be an “invitation” to Britain, France and the United States to strike the country. He also claimed to have “irrefutable proof” that the Syrian opposition was planning a chemical attack, but he did not offer it.